How would you like to have a fresh bouquet of flowers every single week? Small shares will come to you in a small pint-sized Mason jar, ready to display on your table. Jar must be returned each week for your refill. Large shares will be a paper-wrapped bouquet, ready for your favorite vase. 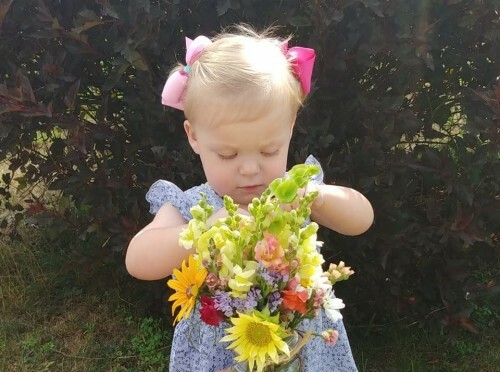 The price is affordable...much less than traditional florist prices, and even less expensive than your local grocery store blooms. AND...the added bonus is that you are buying local, so you will see unique, in-season blooms each week! Check out a sampling of our flower varieties here. Back for the 2019 season with a new design! Add on a locally crafted flower vase from Sweet Fern Pottery. Sarah Burns is a gifted artisan who has been an amazing advocate for community programs. 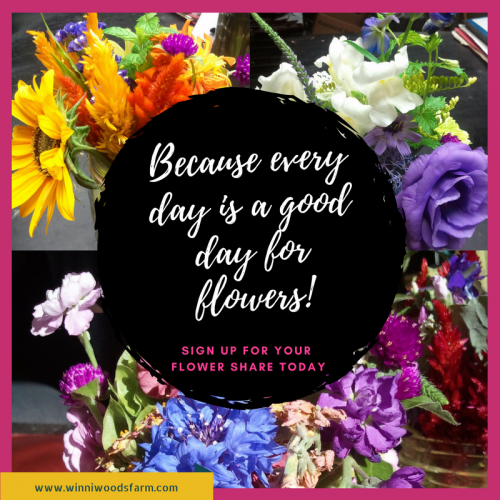 Your 2019 vase will be a custom-design made specially for Winni Woods to best complement our local blooms! Your only "job" is to arrive at your selected pickup location (return the previous week's jar, for small shares) and we'll have your next share ready for pickup. With care and little attention, you can expect your flowers to last at least a week if not more. Many of our CSA members tell us that they have to transfer their blooms to a vase of their own just so they can return the jar each week because their flowers are still going strong!